Order Entry is the “heart” of E2 Manufacturing. This is where jobs are created, and jobs are what drive the production process. Sales orders give you the capability to combine multiple sales orders into one manufacturing job. Your sales forecast will transform into a production plan, which will lead to economies of scale. You will have complete visibility of what is running on the floor 24/7 and future production needs. You still have the flexibility to adjust to suddenly changing customer circumstances. The manufacturing jobs can be adjusted at any time so you can respond to customer needs instantly. Reduce inventory costs by having Purchasing take into account the projected future need for material or components. Your material needs also tie into the Scheduling Engine, which is nice for people making sub-assemblies and other long running jobs. E2 Order Entry combines multiple sales orders into one manufacturing job to streamline production. Order Entry provides details related to production that can be used to drive scheduling assumptions, generate work documents, and create requirements for material and services. Every order is the record used by the system to track customer demand and production related details. Order Entry also has the flexibility to enter order types that fit your business. E2 Order is the record used by the system to track customer demand and production related details. Job numbers are automatically assigned and incremented with each line item on an order. Materials may be allocated to the job during order entry, ensuring any available inventory is accurate. Permanent BOM allows for quick estimating at the job level for time and material for jobs. Job Material Processing allows the flexibility of processing jobs immediately or manually selects the jobs to be processed at a later time. Job costing displays in real time for sub-assemblies and displays estimated vs actual costing information for comparison. 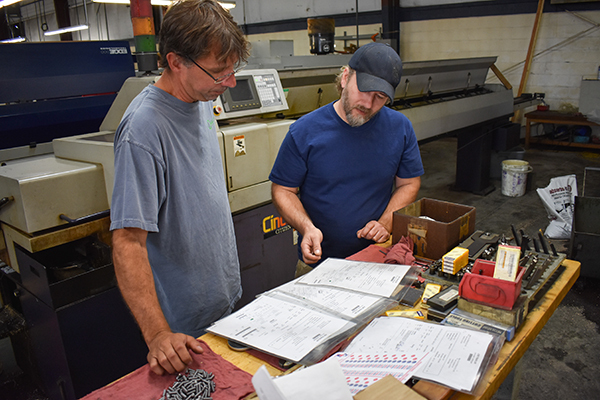 With EDI capabilities in E2 MFG, users can eliminate manual data-entry errors, streamline transaction processing, and increase productivity without increasing staff. Your shop will benefit from improved information flow, accurate accounting, and better inventory management. Transactions between Shoptech and the EDI service provider will automatically be created in the correct format. Users have the ability to accept incoming EDI orders and have them automatically or manually entered into the E2 MFG database. Users also have the flexibility to change existing orders. Automatically generate outbound EDI shipping and billing information in real time. An option to specify at the company, customer, and shipping levels determines how EDI transactions will be handled.